A Gray Jay perches on a branch near a pond in northern New Hampshire, Oct. 2014. Gray Jays are quickly becoming one of my favorite birds. Their range does not stretch into southern New England, but on my last several trips to northern New England, I’ve seen these handsome and friendly birds. I have been visiting the northern reaches of New Hampshire for more than 20 years now and I started seeing Gray Jays only in the last few years. They appear out of nowhere and offer close views. They seem to be as curious about you as you are about them. From what I’ve seen, they hang out in small flocks (3, 4 or 5 birds.) 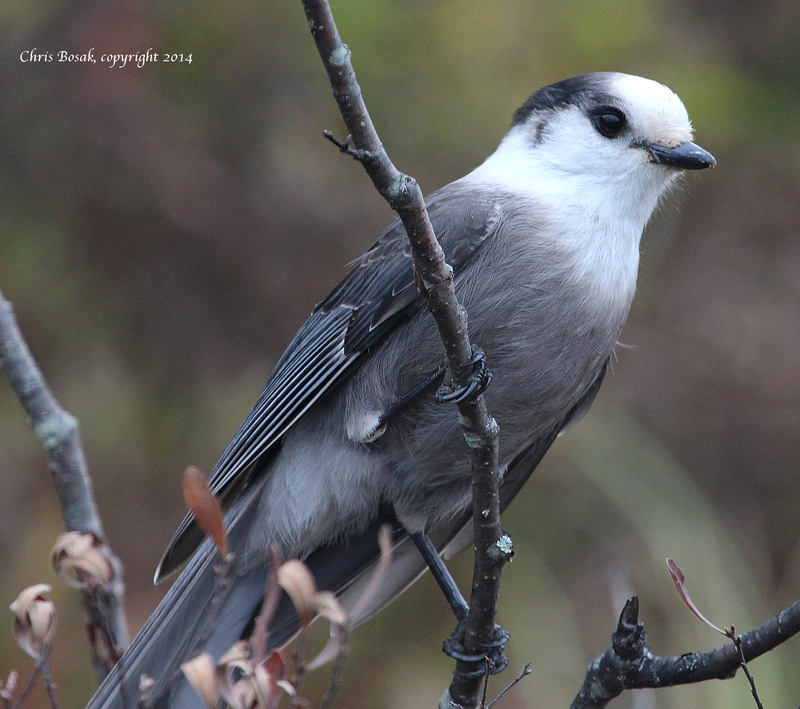 Gray Jays are one of those boreal species that makes the Great North Woods so special. I took the above photo while canoeing on a small pond in northern New Hampshire. This one flew right up to the pond’s edge to check me out. This entry was posted in Birding by canoe, birds of new england, Boreal birds and tagged birding columnist Chris Bosak, birds of New England, Gray Jay, Gray Jay New England, Gray Jay photo by Chris Bosak. Bookmark the permalink. How do you get such great closeups of these beautiful birds? It’s like they are posing for you! I love the eyes of the Gray Jay. Are they at all related to the Blue Jay?